Toddlers Prefer What Kind of People? Two people bump into one another on a narrow street while going in opposite directions. After some interaction, one bows down and moves aside to let the other go on his way. 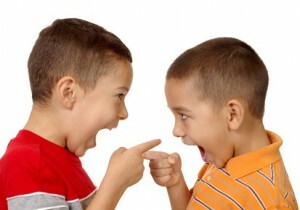 Which one does a toddler like best: the one who bows and steps aside or the one who got his way? In another instance, two people bump into one another on a narrow street while going in opposite directions. After some interaction, one pushes the other one down and goes on his way. Which one does the toddler like best: the one who uses violence to get his way or the one who was pushed? In a final scenario, a person is trying to accomplish a goal. One person steps in to help him achieve his goal. A different person steps in to impede him from reaching his goal. Which one does the toddler like best: the one who helps or the one who impedes? Researchers have used puppets to explore all three of these scenarios with toddlers. In the first scenario the toddlers liked the one who got his way rather than the one who bowed and moved aside. However, in the second scenario they did not like the one who got his way through violence and force (read Toddlers prefer winners, but avoid those who win by force for more). In the final scenario, they liked the one who helped the other achieve his goal (Check out Can Babies Tell Right From Wrong on YouTube for more). Isn’t that interesting? Even toddlers show a preference for certain types of people. Specifically, they like those who win in conflict due to social status without the use of force or violence. And, they like those who help others. They do not like those who are mean or violent. Seems obvious, but think about what this means for parents and families? I think it encourages us to do at least three things for the benefit of our children. Model kindness in your own life. Be kind to one another within the family and be kind to those outside the family. Not only will this model good values, it will nurture your children’s admiration of, and respect for, you as a parent as well. This, in turn, will increase their willingness to listen, live by family values, and cooperate when family disagreements arise. Accept respect and kindness from others. Let your children see you graciously accept positions of status or prestige while remaining humble. Knowing that you hold a position of some respect can nurture your children’s sense of security…but this is only true if you accept that respect graciously. And, we all hold a position of prestige and respect as a parent. Accept that honor and respect from your children with grace and humility. Do not respond violently toward others. This not only includes physical violence but verbal and relational violence as well. We can become violent in our words, our tone of voice, or our volume just as much as we can through physical stature and actions. We can also show violence in our attitude toward others, by demeaning another person’s character or undermining another person’s authority in a given situation. Each of these represents violence. Seeing this violence in their parents can reduce children’s respect for, and trust in, them. Children do not like to be around people who can become mean and violent. It’s scary, frightening. Do not become violent toward your spouse (in how you disagree, talk about them, or talk to them), toward your children (in your discipline, in your words to them, or your descriptions of them), or toward anyone outside the family. Instead, show kindness. Model kindness. Graciously and humbly accept respect and kindness from others. Do not be mean; do not respond to others with violence of any kind. As you engage in these three practices, you will nurture your relationship with your children and encourage them to grow in kindness and grace. Who could ask for more?